The Wolf Dude's band, The Howlers, split up a week ago when the drummer, Shedding Hairs, ran off with the Wolf Dude's girlfriend, Luna. Now he's threatening to run off and join the circus and it's all my fault. You see, I told him about my circus, The Chalkstripe. I told him it was a weird and wonderful place where good things happen, only I lied. It isn't a good place at all, as you will find out when my story 'Parasol Dance with the Chalkstripe Man' appears in Sideshow Fables later this year. Anyway, so now I need your help. I want to convince the Wolf Dude that circus folk should not be trusted. That they are places full of Shedding Hairs and two-timing Luna's. And of course, I wouldn't ask you to help without giving you a chance to win a reward. Now you're wondering what kind of reward and what you have to do to deserve it. First off let me tempt you with the prize. Plus a signed novella from PS Publishing (I'm not telling you which one because it's nice to receive surprises). 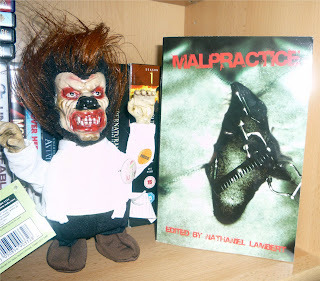 Second prize: A copy of the Malpractice anthology. Booby Prize: A used copy of Neal Shusterman's 'Unwind', which I have read and loved and need to pass onto someone, plus a signed novella from PS Publishing. 1. Leave a comment on this post giving the name of a ScaryCircusAct (TM) that you think will disuade the Wolf Dude from joining the circus to win the first or second prize. 2. To win the BoobyPrize, link to this competition in your blog (and leave a note in the comments section of this post to say you have done so). 3. You may enter to win both the First, Second and Booby prizes. 4. Competition is open from now until Midnight Friday 20th March 2009 GMT. 5. You can enter as many times as you like. 6. Check back on Saturday 21st/Sunday 22nd when I will be posting the names of the winners along with my email address so that you can contact me re receiving your prizes. If you run away and join the troupe of ScaryCircusAct, this will happen to you. Every day. Especially while you sleep. they will fuzz your hair and turn you into the cutesy poodle act, the one where they jump through hoops and have to walk on their hind legs (not that walking on your hind legs is really a trick) you will be forced to wear tutu's, pink ones,during and after the act. Very scary. Because the biggest sensation in circus acts this year is the Penn and Teller bullet-catching act...but Teller has taken ill with kidney stones (oddly, bullet-shaped), and Penn needs a new partner. He did say in the job advert that the bullets are silver-ish, but may only be plated, so it's "totally safe for were-folk". Also, Penn has just come off of methadone and shakes like a paint mixer, but he expects to have that under control soon. Oh...Wolfdude, how you have strayed! Beware of the Living Carousel--you just might find a pole jammed through your innards and a small child straddled on your back, prodding your sides with his little boots and tangling a sticky fist in your hair. Ouch. All of these seem very frightening so far. I linked from my LJ so please consider me for the booby prize. Meanwhile, I'm thinking up something to scare Wolfdude away from the circus. The above answers are fiendish! Wolfdude, if you join the ScaryCircusAct you’re at risk of becoming a victim of the Freaktaculars who like to extricate brain matter and perform parlor tricks with it. Funny, as I pondered the question, I kept coming back to the scary puppet act from "Lili" with Leslie Caron. So I go to Wikipedia to refresh my memory about "Lili," and learn the screenplay was adapted from a short story by Paul Gallico. There may be hope for us short story writers yet! Steer clear of the masochist children as they Bob For Apples. You see, the poured out the water and the apples and replaced the apples with rotten potatoes. Oh, and they replaced the water with razorblades. Oh Wolf Dude, how could you let your despair drive you to THIS? Well, if you must leave with the Circus, at least watch out for the medicine show that's recently attached itself to their entourage. forget Snake Oil; I hear Madame Aconitum is famous for her wolfsbane potions. I heard the Trapeeze Act of Tearing Extremities is particularly gruesome. You might want to stay out of that one Mr. WolfDude, sir. The Chalkstripe is no place for a fellow of your stature. You've got your whole future to think about. Haven't you seen them juggling silver-teeth-tipped chainsaws, backflipping into dumpsters, and kissing bearded ladies? Is this the future you want? True, it would be pretty sweet to be fired out of a cannon, but...no. Let's not think of these things. Luna's not worth The Chalkstripe, dude. Besides, didn't you want to start that solo career anyway? Be good to yourself, WD. I may have to bring in two teenagers to help me choose. I totally got *ahem* distracted yesterday and didn't post the link until today. But I'm totally in for the booby prize if you're still game! I'm totally in for the Booby Prize! Thank you to everyone who entered and linked. The results have been posted.